Good fences make good neighbours they say, but to be honest I'm not sure that any of these sort of fences are proof against neighbours, not if those neighbours are Saxon or Pictish raiders. 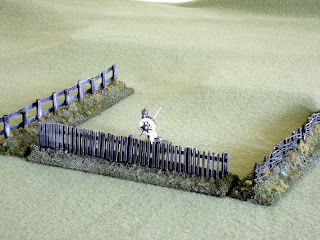 The Dux Brittaniarum rules call for eight inches of fences for a village. I think the best way is to make a series of short pieces, say three to four inches each, and make three or four pieces. 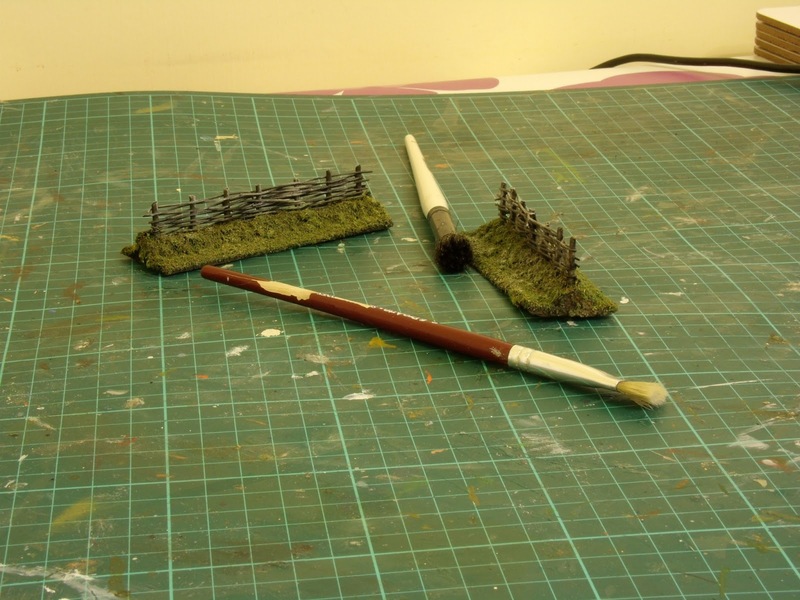 The bases here are 2mm MDF, which is not always the easiest stuff to get hold of, but Jackson's Art usually carries it in various sizes in their mount boards section. A narrow strip of wood, chamfered with a plane, gets glued down to the centre. 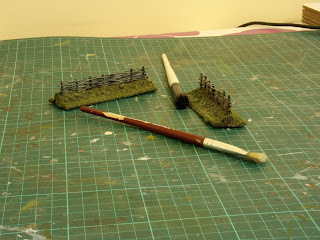 This gives something for the fence posts to sit in while not making the fence so wide that any mini's are miles back from it. Plus it make the base of the hedge wide enough to retain a decent level of stability on the table. 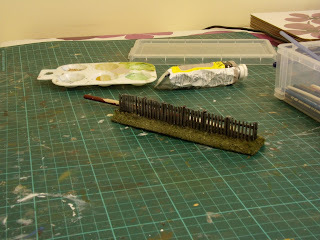 The first bit of fence is made the same way as the pig sty fence here, with cocktail stick posts and MIG wire woven through. I made two four inch sections. This is the sort of fencing that might be put in quickly as a temporary fix, so short sections give some versatility. This is quick and easy but only moderately robust - the cocktail sticks don't give a lot of strength. If this bothers you use the variations below. Woven timber fence - entry level! 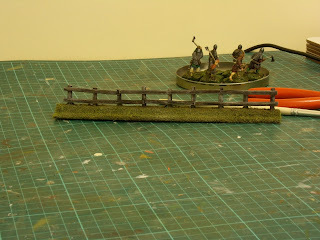 The second bit is a post and rail fence made by gluing sections of bamboo skewer into holes in the base. The rails are made from bamboo skewers split lengthways. The post structure is stronger, but the rails can become detached (just like the real thing actually). A single eight inch section of this represents the baseline sort of fencing you might find. Post and rail - a little more up market! 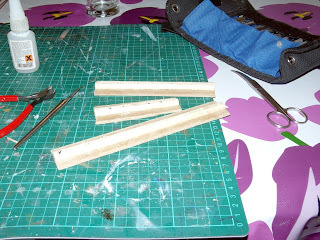 The third piece uses bamboo skewer for posts, with some 2mm balsa superglued horizontally between them. Two pieces, one about 5mm above the ground level, one 5mm below the top. Then loads and loads of 1-2mm wide balsa strips glued vertically between them. This looks very smart and might well be the early Medieval equivalent of remote-control gates, but it does take longer (much longer) to construct. Since this is a bit posh and pricey, there's only a six inch length (perhaps to go near the church?). Picket fence - very particular! Here they are, all finished. I added scrub and static grass around the woven fences and the post and rail, but not the picket fence. Well, anyone posh enough to have that is going to do his weeding, isn't he? The armoured sub-Roman warrior (finally!) for scale is from West Wind, with a home-made chi-rho shield decal. Nice tutorial on fencing. Thanks for the link as well. All very informative. I also learned a new word, chamfering. In my ignorance I would have called that beveling. you'd actually not be wrong. A bevel and a chamfer are indeed extremely similar. Apparently, technically a chamfer goes all the way between two surfaces and a bevel doesn't, but then the angled bit on a chisel or plane blade is called the bevel not the chamfer! Argh! Who knows? This is great. I love little terrain projects like this, they always seem to add so much character to the game for such a small piece. Really nice, thanks for posting!